Flower print skirt and top by Sujon. Crochet shawl by Mrs Cresswell. Shoes by Sacha. Scanned by Miss Peelpants from Petticoat, February 1971. Both outfits by Mary Quant’s Ginger Group. Inset below right, both dresses by Dranella. Midi dress by Marielle. Rosie Nice satin shawl. Liberty print tiered dress by Miss T. Shawl by Mrs Cresswell. Cream boots by Ravel. Multiprint dress, left, by Alan Rodin. Belt from Elliott. Sacha boots. Button front Liberty print dress, right, by Miss T. Suede beaded shawl by Elliott. Choker by Buckle Under. Long Liberty print dress by Wallis. Bag and choker by Elliotts. Shoes by Anello & Davide. Sundress in deep blue rayon crepe with matching shorts by Stirling Cooper. Bikini in hand by Alistair Cowin. Sandals by Ravel. Simply wizard playsuits. Sundresses with slightly flared shorts. Plenty of straps crossing bare backs. Lots and lots of buttons. Super colours. Cotton, crepe and jersey. Wish you were here and looking like this. 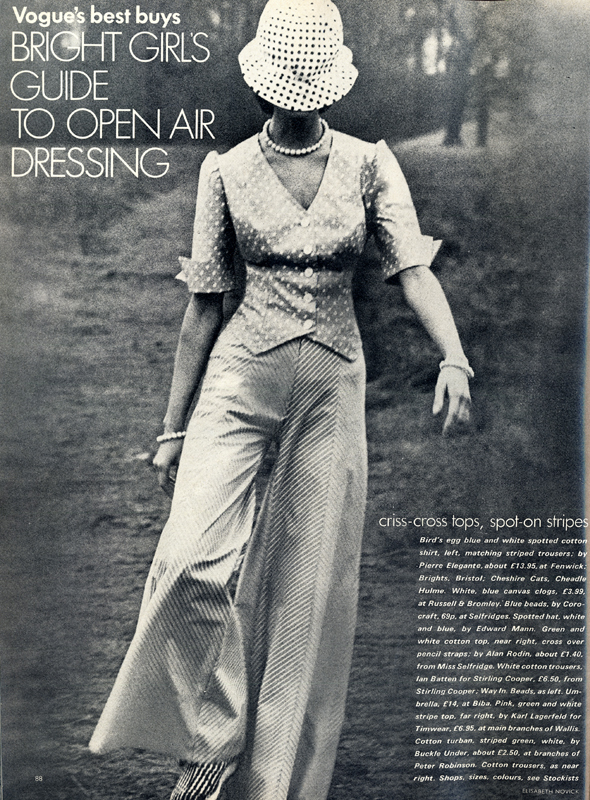 Scanned by Miss Peelpants from Vogue, May 1971. Playsuit in chocolate jersey, ginger edged. By Copper Coin. Straw hat by Buckle Under. Shoes by Ravel. Sunsuits in Madras patch cotton by Marielle. Sunhats by Titfers. Canvas shoes by Masotti. Right: Playsuit by Bus Stop. Sandals by Ravel. Playsuit in canary yellow on dark brown cotton by Alistair Cowin. Shoes by Ravel. Playsuit in Liberty print by John Marks. Liberty flower hat by Titfers Shoes by Ravel.